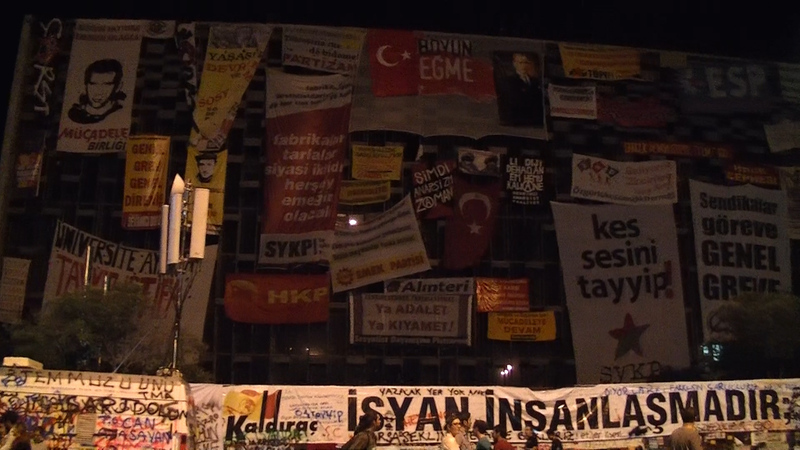 I visited Taksim square the last night I was in Istanbul on June 11. My schedule was such that I would not have a chance to visit the city again for about two weeks, and given the uncertain nature of the square, the police, and the overall situation, I thought it was worth a gamble. I say ‘gamble’ because my CNN-inundated friends and family were all averse to the thought of me even entering the nation of Turkey, let alone the square. 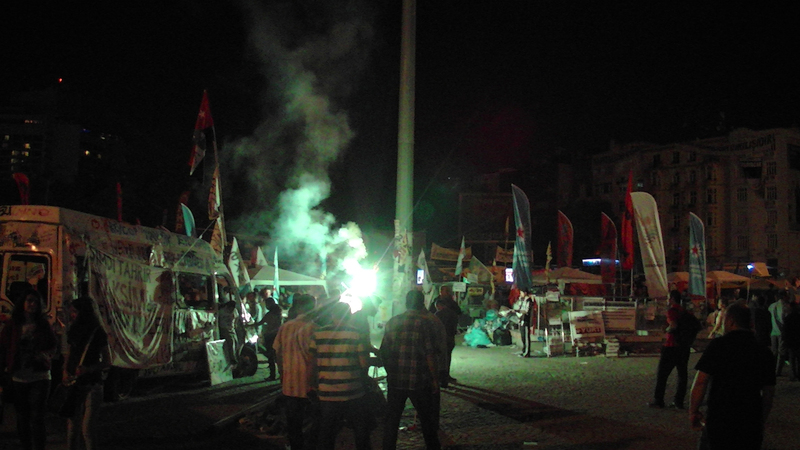 Having watched enough reports filled with conflagrated buses, cars, and mace-spraying riot police, everyone I knew was fairly convinced that Turkey was actually just one city block filled with tear gas, and it probably was not a good idea to travel there. 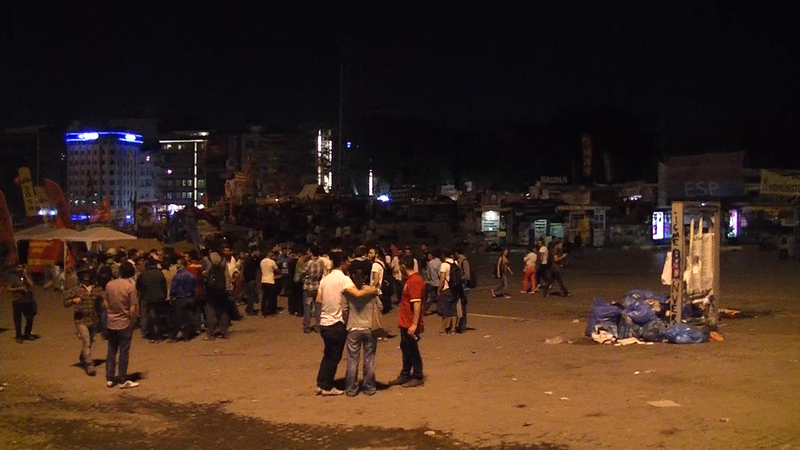 Apparently in the absence of police incursions, the square had become something of a party spot. 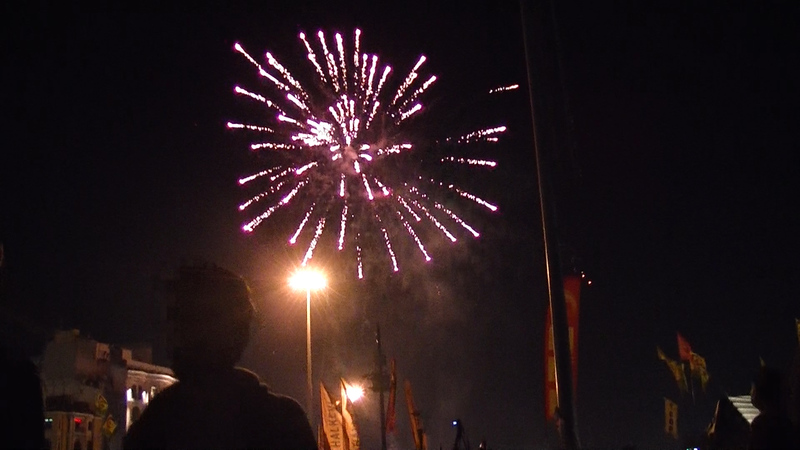 That sunday it had been filled with families, food, dancing kids and all the like of a good day out. 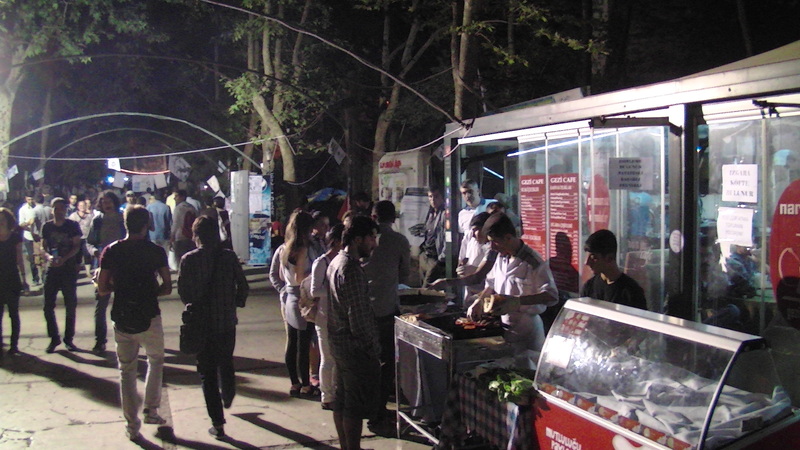 With an atmosphere apparently akin to the weekly ‘Tam-Tams’ gathering at Montreal, Canada, it also had the full gamut of street foods well into the night. This included kebab meats, fresh tomatoes, cucumbers, other vegetables, bagels, and mobile vendors of corn-on-the-cob – something I’ve enjoyed in Canada before but never as the form of street fare by which it pervaded Turkey. Corn-carts at most popular street corners just seemed a bit surreal to my north american sensibilities. 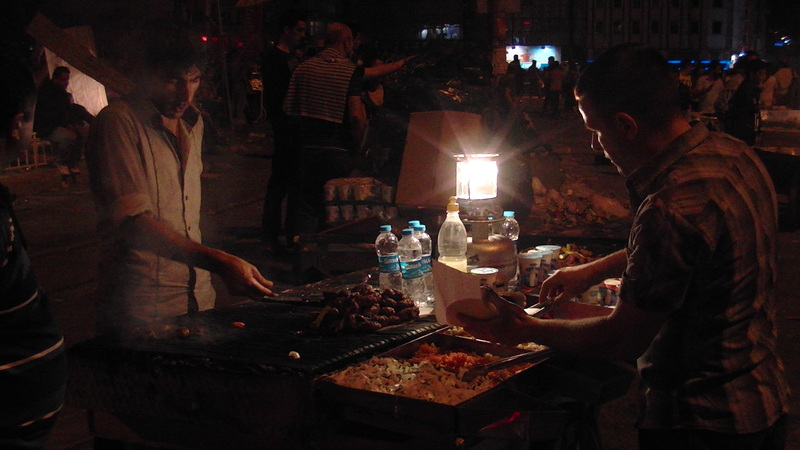 Needless to say, regardless of your taste in food, Taksim was a place one could have a good time, be well-fed, and get a fair education in the dissident political movements in the country at the time. The square, at any other time, was a your typical city block left empty for gatherings, festivals and other civic purposes. It was nestled in a fairly commercial area of the lower-middle class part of Istanbul, surrounded by shops, hotels and tourist hostels. Perhaps notable is it’s history as a left-wing rally point for protests, and most particularly the May day massacre during the 70s. Generally it is accepted that at least 50 people were either shot or run over by armoured vehicles. 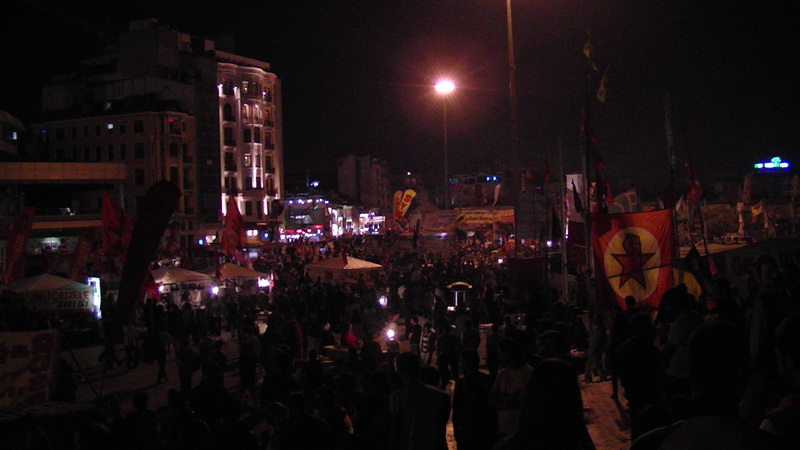 What brought Taksim to a boil over the summer of 2013 was a minor protest over green space that subsequent touched off major simmering points of distrust and resentment with the current government. Taksim henceforth was testament and witness to an underground political culture that was both radically averse to the conservative Justice and Development party (and it’s understandably insufferable leader Erdogan) yet simultaneously schizophrenic; scattered between a dozen different ideological directions that each had their own kiosk in the square. Slowly turning one’s gaze across the square, it is touching to take in some sights one may never behold in the consolidated democracies of the developed world: revolutionary banners draped over the entire sides of apartment buildings, black flags for the anarchist section. 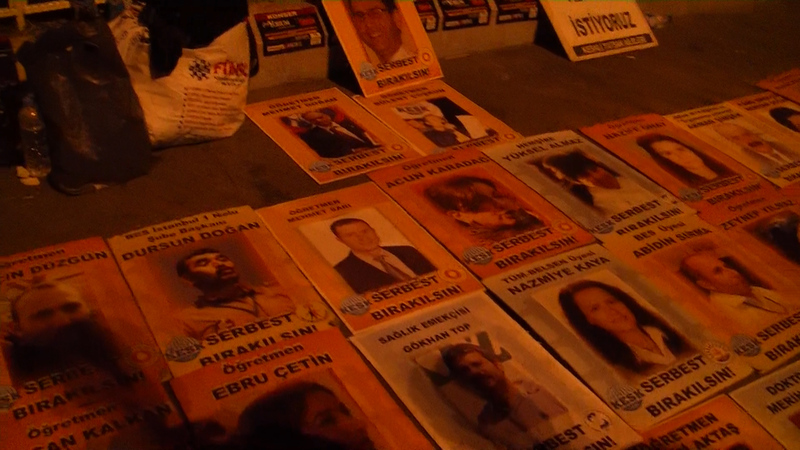 On the ground, lines of portraits of missing or imprisoned journalists. 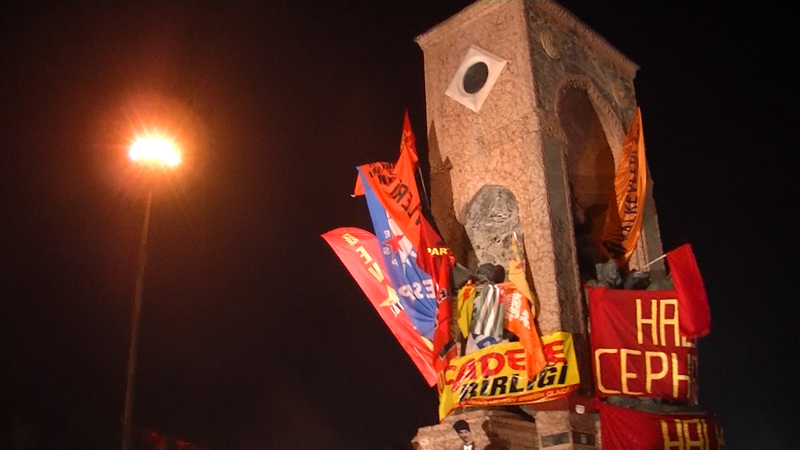 The centrepiece of the square – Ataturk’s bronze likeness – is now clothed with socialist banners, with a flag protruding from every possible point that can hold one. 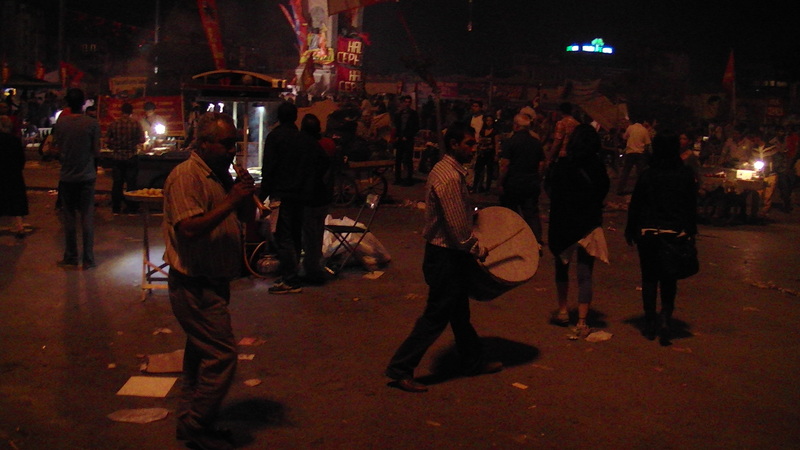 Protestors no doubt operated during the square’s heyday from early morning to late at night, with a minor break for sleep in the nearby tent city adjacent to the square. All this was in violation of the law, all the activity the result when a government will not compromise and an urban population will no longer acquiesce. 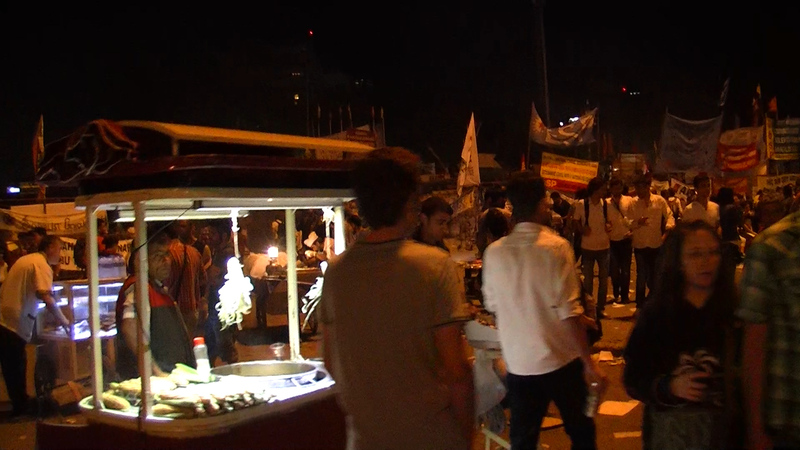 It was inspiring to see such a site of civil disobedience within a foreign country. The trappings of the protest were par for Montreal standards by way of pop chants, noise makers and dancing. It was off the charts by the nature of the protest within such a restrictive country. 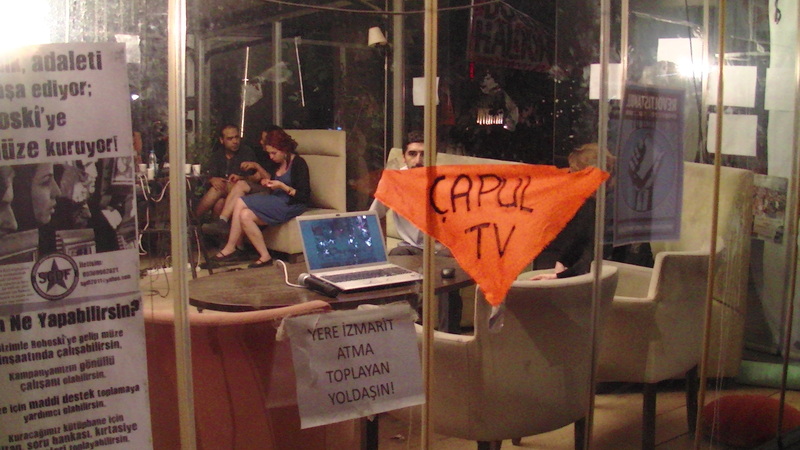 While CNN Turkey famously beamed pictures of penguins through all the country during the riots, the dissidents set up their own TV station to broadcast their updates. A few hundred meters from the menagerie of disappeared journalists, students and citizens waited by the dozens to watch newly produced documentaries about the abuse of power in their country. It was brazen and stirring, and made me wonder if we had not lapsed into complacency back in the supposed land of the free. The honeymoon of the revolution was short-lived. 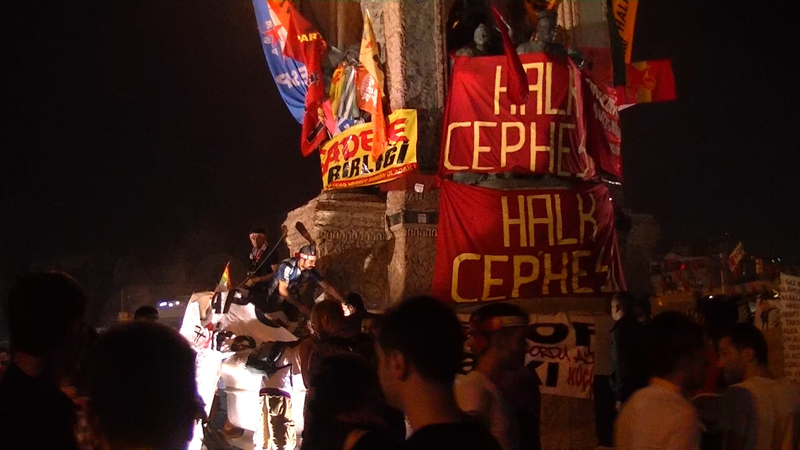 A few days after leaving Istanbul, the police again returned to clear protesters out of the square. 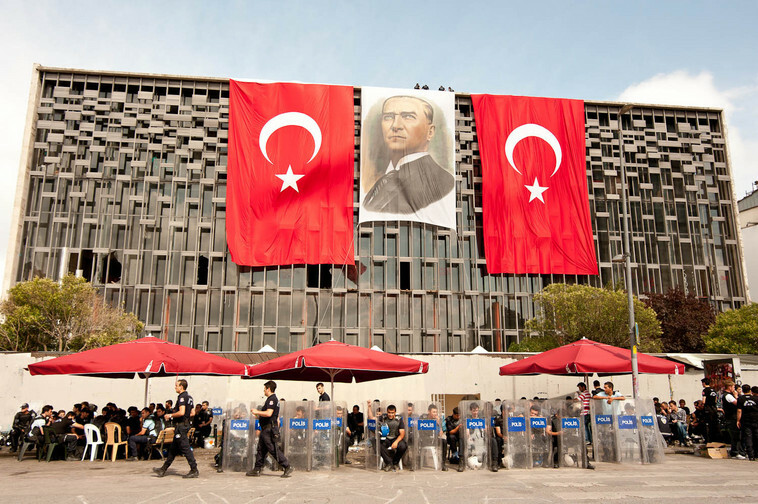 They were partially successful, and as credence for their work, they removed the colourful array of banners on both Ataturk’s statute and the surrounding walls, to be replaced simply with flags and portraits of Turkey’s modern founder. Civil expressions of patriotism must be tightly controlled when a nation sits on the precipice between two different histories, with different trajectories, and different ideologies. Even as technology allows citizens to bypass government controls, Turkey clearly remains a house divided within itself. It houses two very separate and insulated spheres of life. One stills sees the nation as a historic fallen power, and every expression of distate for the ‘Copulcos’ places the protest in the context of the consequences it will have on Turkey’s progress and it’s power and place in the world. The other side is urban, liberal, and chaffing at not only the legal restrictions but the sheer paternalism of the ruling party’s leader, Tayyip Erdogan. These two compliants are not irreconciliable. Turkey can grow and be liberal. But the channels by which political power has been expressed in this nation’s long history have fixed perceptions of the game as zero-sum. Each side feels they are losing and is less and less willing to commit to any concession. The singular personality cult of Ataturk; the long tradition of technocratic reform from the center; the role of military power, several coups and the recently dissolved ‘deep state;’ all make the government an object of capture in popular democratic competition, and not the impartial arbiter that Turkey so desperately needs. Statesmanship is wanting in today’s Turkey. Hopefully they will find it.